1890-1934. — 1 cm of textual records. — 75 photographs. Anders Lunseth and his wife Mali ( Hjelseth) emigrated from Molde, Norway, in the late 1890s and first settled in Pope County, Minnesota, USA. Around 1898 they moved to Upham, North Dakota. They then moved to South Fork, Saskatchewan and in 1913, they travelled the Edson Trail to reach the Peace River country They stayed with the Ronnings for a time while their house was being built. They had persuaded the Hagens to come north too and when they did, the two families (25 people) lived in the Lunseth house until Hagens got theirs built. Lunseths were the first family in the Molde district so they were responsible for the mail at first. In 1923, the Lunseths moved to Bend, Oregon, but returned to the Peace country in 1926. Mr. And Mrs. Lunseth were active community members, helping with the building of the Molde School and the Valhalla Lutheran Church. Mrs. Lunseth was active in the Ladies Aid and the Women’s Institute. They had 12 children: Oluf, Anna (died 1911), Carl, Alfred (died 1925), Elmer, Ole, Ragna, Marie who married Harry Hoosier, Inga, Louise, Morris (died 1972) and Helen who married Emanuel Dolemo. Anders died in 1929 and Mali in 1934. The photographs were preserved by Helen Dolemo and passed on to her neice, Ruth Tanchuk ( Hoosier, Oakford). They were donated to the South Peace Regional Archives by Ruth’s son, Kim Oakford in 2006. The fonds consists of 75 family photographs and a collection of cards and a communion booklet. Series 297.01 Lunseth & Hjelseth families in Molde, Norway. — 1890 -1910 c.. — 25 photographs. Mali Hjelseth’s parents and siblings in Molde, Norway: Anna, Knut, Ingeborg, Ragna, Mr. Hjelseth, Ole, ___, Ingeborg (mother of Mali). Anders and Mali Lunseth after they had settled in Valhalla, Alberta. Anders and Mali Lunseth and their family after they had settled in Valhalla, Alberta. 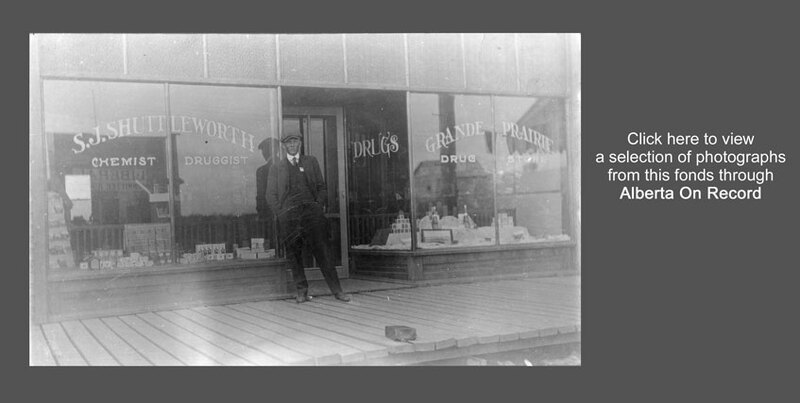 A man stands in front of Grande Prairie Drugs, owned by S.J. Shuttleworth, drugist. Grande Prairie Mail Horses Leave Edson, 1915 c.
Series 297.02 Lunseth Family in Minnesota. — 1895 c.. — 13 photographs. Series 297.03 Lunseth Family in North Dakota. — 1900c.. — 7 photographs. Series 297.04 Lunseth Family in Saskatchewan. — 1910-1912. — 12 photographs. Joseph “Edgar” Gilbault, 1912 c.
Joseph “Edgar” Gilbault, husband of Anna Marie, Margrethe Lunseth. Series 297.05 Lunseth Family in Valhalla. — 1913-1934. — 18 photographs. Series 297.06 Lunseth Family Paper Artefacts. — 1919-1934. — 1 cm of textual records. The series consists of post cards, greeting cards, a booklet “Follow Me” given to Helen Lunseth on the occasion of her first communion in the First Luthern Church in Bend, Oregon, where the family lived from 1923-1926 and a farewell card from the Molde School teacher, Lena Hommy, to her students (all listed in the card) in 1919.